Always bragging about your ability to eat the hottest of chillies? Now is your opportunity to showcase your chilli eating skills by taking to the stage in a small Mexican town for a Jalapeno eating contest – where wins as hot as the chillies are up for grabs! Entry to this chili-eating contest is easy for everyone thanks to the low entry fees. 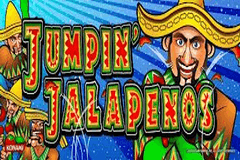 Boasting a typically high return to player percentage of 96.03% which is typical of WMS, the Jumpin’ Jalapenos slot machine consists of 5 reels and 50 paylines. Rather than a typical 5x5 grid though, the first and fifth reels only have four symbols while the second, third and fourth have five. You’ll be paying per two paylines with a minimum spin costing 25p and maximum entry fee for the most confident chilli eaters amongst you being £125 per spin! As you’d expect from a slot based on chillies, it’s all things Mexican on the reels. In total there are thirteen symbols, however you’ll be bitterly disappointed by their appearance as the look very outdated in the style of clipart rather than the modern 3D graphics we have become so accustomed to over the last few years. There are two special symbols to watch out for – the Wild and the Scatter. The Wild symbol is represented by the Mexican (presumably representing you at the table of the chilli eating contest) and he can substitute for all symbols except for the Scatter, plus he is the most valuable symbol of all and landing him five times on a payline results in a 20x your stake win. The Scatter is a fiery red Jalapeno and these can appear on the second, third and fourth reels. There is also a raging red bull with steam pouring out of his nose as he prepares to make a charge, a small stone building, taco’s, a Mexican guitar, cacti, plus the usual playing card symbols of Ace, King, Queen, Jack, 10 and 9 which have the smallest payouts of all. The spiciest wins of all which will see you jumping around your room in excitement come in the free spins bonus feature, but you’ll first need to land three or more of the Jalapeno’s - which only appear on the second, third and fourth reels. This combination actually triggers pretty frequently and each time that it does sees you rewarded with 12 free spins. Unfortunately, there are no juicy multiplier bonuses to make them Jalapenos taste even better but each time you land a Mexican Man (the Wild symbol) the reel that he appears on will be nudged until he covers all of those positions for a stacked Wild – which always results in much larger wins. Finally, if you can stand the heat of the chilli’s you can also trigger additional free spins simply by landing three or more Jalapeno’s again – a feat that sees 12 more spins added to your current total. The Jumpin’ Jalapenos slot machine features very simplistic graphics which will not appeal to those of you that enjoy real money online slots with 3D graphics, however they are rather quirky – especially the Mexican and the Bull. Fortunately, there has been some effort put into the sound effects with a Mexican guitar and the thundering sounds of the Bull accompanying gameplay rather than standard stock sounds we have heard in so many slot machines from WMS. It’s all about the free spins mode where you can win 12 free spins along with the opportunity to retrigger even more, but it’s the stacked Wilds that are created each time you land a Mexican on the reels which create the fieriest of wins!